Its been a few weeks now since I’ve rejoined the forces of Middle Earth to fight against the evil within it and I have to say I am rather enjoying myself this second time around. Could it be all the new content that was added during my time away that has sparked these feelings? Quite possibly. I’ve played through Book 11 and am in the beginning chapters of Book 12 and I have to stay that the storyline is very enjoyable to go through. Aside from that, my Kin also has its own house now which I visited for the first time yesterday. Nothing big, but it was cool to see the neighborhood. Book 12 also introduced new clothing options and while I myself have not been playing dress up, its nice to see people walking around that all don’t look the same. 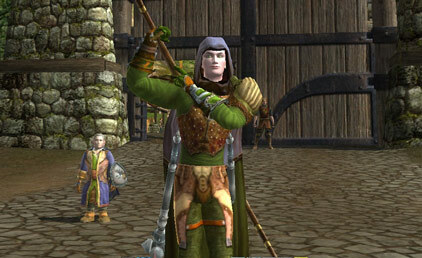 There is one major new raid, The Rift in Angmar that is a hot spot for some of the best new items in the game, both drops and barter items. This raid was added in Book 11, not 12, but since I missed Book 11, its still new to me. It’s a 12 person raid where the end boss is a Balrog! Common, you know the huge fierly creature that Gandalf fought in the first Book of LoTR while traveling through the mines of Moria. Very cool new raid quest. I have also noticed that PvP has become much more popular. I’ve yet to go to Ettenmore where some sort of raid wasn’t going on. Aside from the beefed up action, there are actual good items now that you can obtain by participating in the raids and PvP, which most likely is the reason why its become more popular. Overall I’m happy that I went back to LOTRO. Oh and if you couldn’t tell that hunky elf hunter is me :) Damn check out those guns. Spy-Fi Global Agenda is SPY-riffic! Is WoW Killing the Industry?